Canberra will wipe the slate clean after storming to a 42-22 come-from-behind victory over the hapless Warriors and snatching home advantage in the first week of the NRL play-offs. 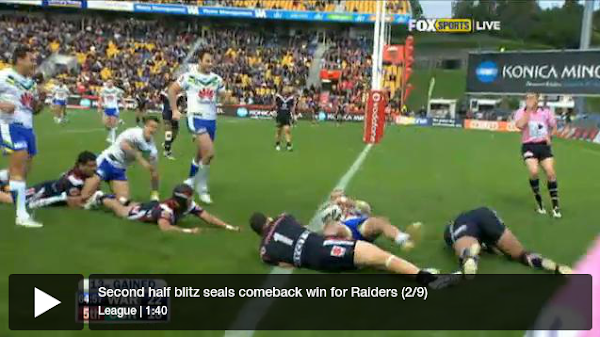 The Raiders’ victory in Auckland on Sunday, when they turned around a 22-6 half-time deficit to rack up 36 second-half points, means they will host Cronulla in an elimination final next weekend. Having languished near the foot of the table earlier in the season, Canberra have now strung together five wins in a row for huge momentum heading into the post-season. I’ve previously talked about the fickle nature of the Canberra crowds for all sports. It’s demonstrated here on The Riot Act, and in particular for Raiders supporters. The Raiders lose a game or two, and you’re almost guaranteed that the supporters come out and bay for the blood of Furner, the board, just about everyone except the players. The Raiders win five in a row, cement a home final against a team they beat 36-4 less than two months ago, and a solitary Raiders fan posts on here. I think some of the supporters need to stand in front of a mirror for an hour or two, and stare intently. At the Raiders vs Sharks game at Bruce earlier in the year I was appalled at the Raiders fans leaving 5 minutes after half time. The Raiders were still in with a chance, but the fans didn’t want a bar of it. He’s massively overrated anyways. Whitey only made it to the Storm because of his coaching contacts, and they only wanted him if they were rorting. He never made any winning contributions to Origin, and his performance at Canberra has shown his true value for money. It will be an interesting contest as both teams have beaten each other away. Hopefully the Sharkies can chalk up another win in Canberra! I certainly thought Furner should have been axed if things kept going. eg if we finished down the bottom, fighting off the Roosters, Panthers and Eels. However Furner has shown and perhaps the players tas well, that they can play to their potential. The Raiders do have a record of making the finals and then playing crap the next year. I give them credit for the fact it would have been easy to say Campese is injured, so is Brett white, we can’t be expected to do as well this year. The real test will be backing it up and making the finals next year and playing a lot more consistently. I’m guessing the tongue-in-cheek use of the words ‘thrilling’, ‘stirring’ and ‘supercoach’ mean you’re not really ‘thrilled’? Hahaha! Sounds like you didn’t watch it yourself either? Hmmm, perhaps we could say that all the negative comments spurred them on to play/coach better? Surely it’s time for all the Furners to be given the boot. I mean how many chances can these fools get?